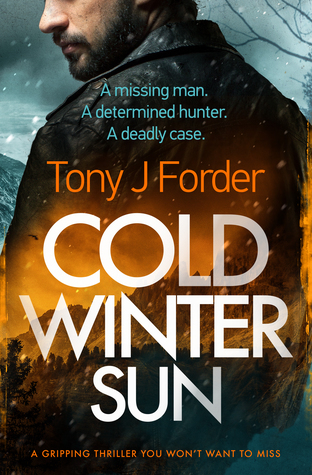 I am absolutely delighted to be sharing my review of Cold Winter Sun by Tony J Forder. I have read all of this authors books and I always love getting an email informing me of a new book. My huge thanks to Emma at Bloodhound Books for the invite and copy of the book. A gripping thriller you won’t want to miss. So, Mike and Terry, they have a great dynamic and have got each other’s back. They have worked together over several years and the camaraderie and bond become apparent as they now enter a new case. This case has emotional implications for Mike as he sees his daughter settled in a new life, with a stepdad that can provide for her. It is a chance for Mike to explain some of the demons he has personally had to battle. Now to the plot, yes I don’t give anything about these away. I will say it is very atmospheric and action-packed. It is a plot that had me guessing as there were a couple of directions I could see it potentially going, and yet while I did guess one or two things along the way, I was still hooked. The things I did guess were later on in the story and there were several other pieces of the jigsaw that I didn’t see. Cold Winter Sun is a book I would definitely recommend. Tony J Forder is the author of the critically acclaimed and best-selling crime thriller series featuring detectives Jimmy Bliss and Penny Chandler. The first three books, Bad to the Bone, The Scent of Guilt, and If Fear Wins, will be followed by The Reach of Shadows, scheduled to be published on 21 January 2019. Tony’s dark, psychological crime thriller, Degrees of Darkness, featuring ex-detective Frank Rogers, was also published by Bloodhound Books. This is a stand-alone novel, and delves into the mind of a serial-killer. Scream Blue Murder was published in November 2017, and received praise from many, including fellow authors Mason Cross, Matt Hilton and Anita Waller. The sequel, Cold Winter Sun, will be published on 1 November 2018. Tony is now a full-time writer and lives with his wife in Peterborough, UK.